Under the leadership of the Dr. Robert K. Crone, vice dean for clinical and faculty affairs and professor of clinical pediatrics and clinical anesthesiology, the Office of Clinical and Faculty Affairs provides guidance and support services related to faculty affairs and clinical affiliations. We are committed to creating and supporting an environment in which faculty members achieve their career goals and full professional potential. 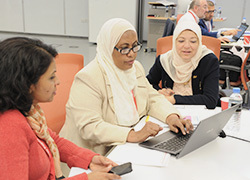 Our mission is to support the mission of the Weill Cornell Medicine - Qatar (WCM-Q) by promoting faculty excellence and offering valuable resources to support the faculty role in providing the finest education possible for medical students, conducting research at the cutting edge of knowledge, and improving the health of our patients and populations. Assist and support the college in recruiting and retaining talented faculty members committed to excellence in teaching, research, and patient care at the evidence-supported optimum rank and on the most relevant career pathway. Assist and support the college in developing and maintaining relationships with hospitals and institutions that provide valuable resources for medical student education and for clinical research. Assist and support faculty in navigating the complex academic environment to pursue academic excellence. Assist and support principal investigators in recruiting and retaining postdoctoral trainees that will contribute in advancing the college’s research mission.